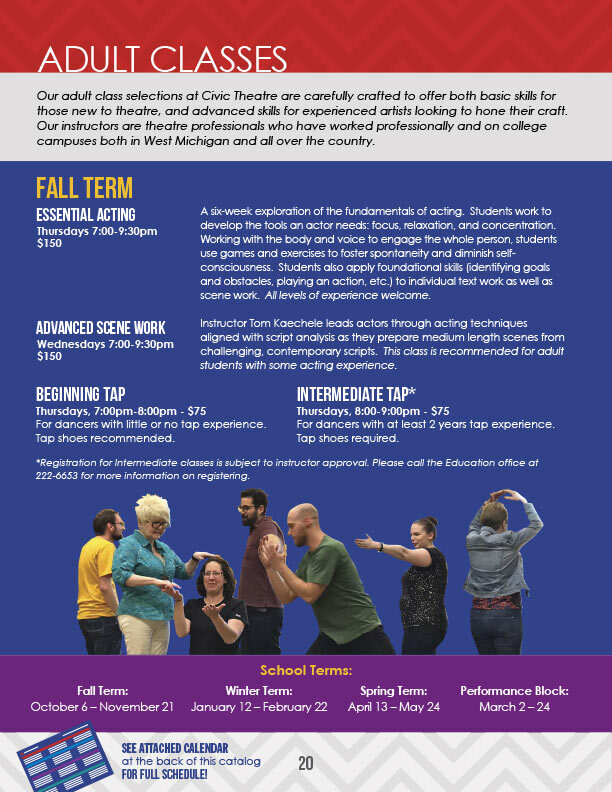 The nationally recognized, Grand Rapids Civic Theatre School of Theatre Arts offers the most comprehensive community theatre education program in the country. It is a chance for students to mentor and learn from professional theatre artists about all aspects of theatre. We provide hands-on opportunities for students to grow in confidence, with an emphasis on creativity and collaboration. 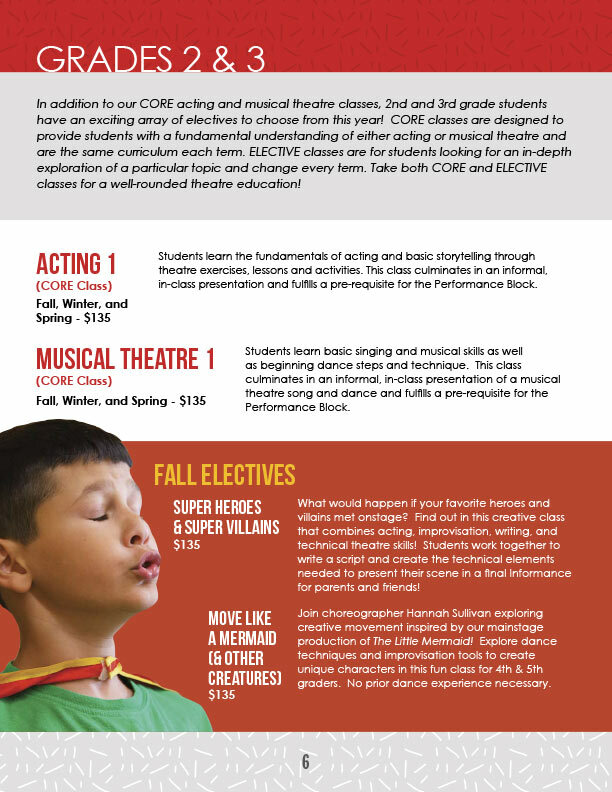 The School of Theatre Arts offers a variety of acting, musical theatre, improv, tech and dance classes for ages 4 through adult. Classes occur as 6 week sessions and are offered in the fall, winter and spring. 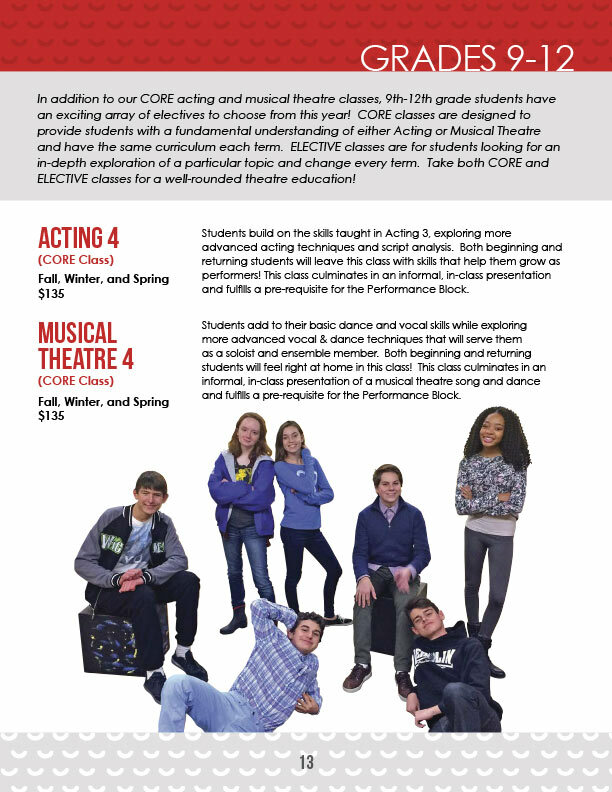 All classes are lead by experienced theatre professionals. The School also provides special workshops and mini-classes on select topics throughout the year. 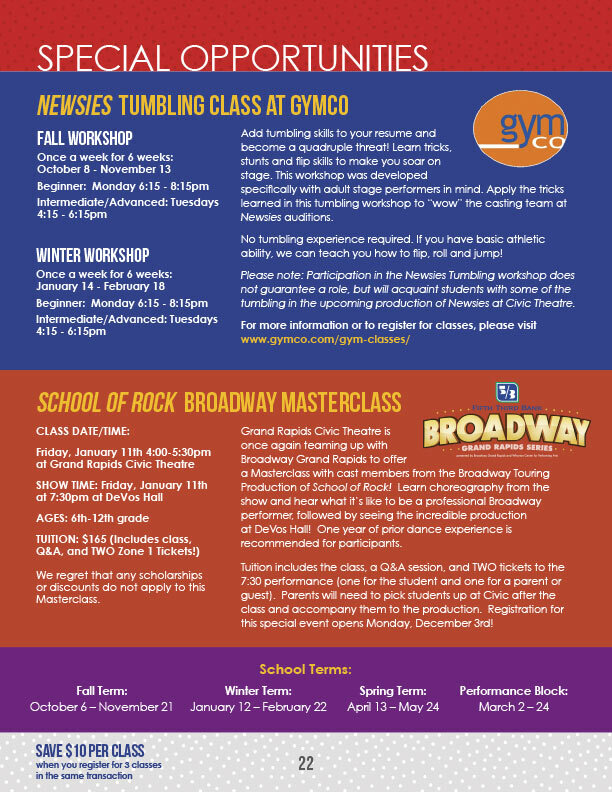 See the class catalog below for registration details and to select which class is right for you. 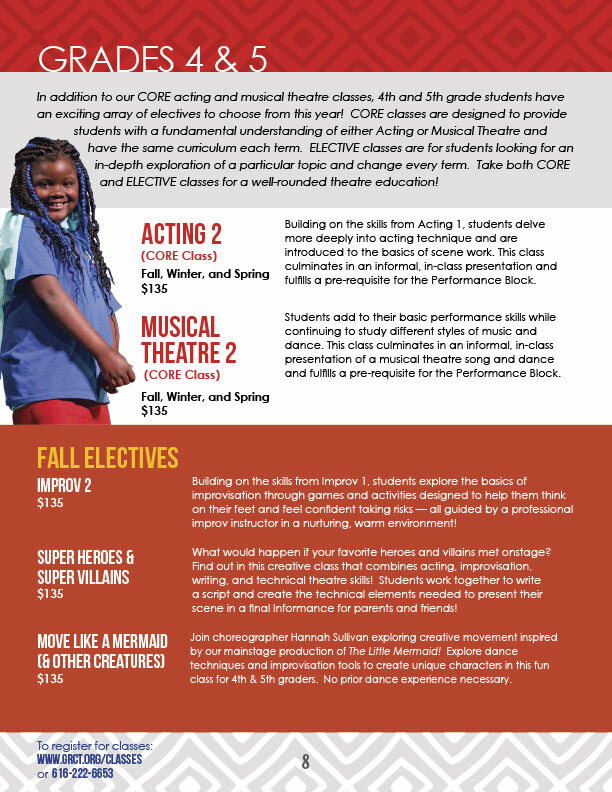 The Grand Rapids Civic Theatre, through the support of generous community members and foundations, is pleased to offer need-based partial scholarships for classes and summer camps. 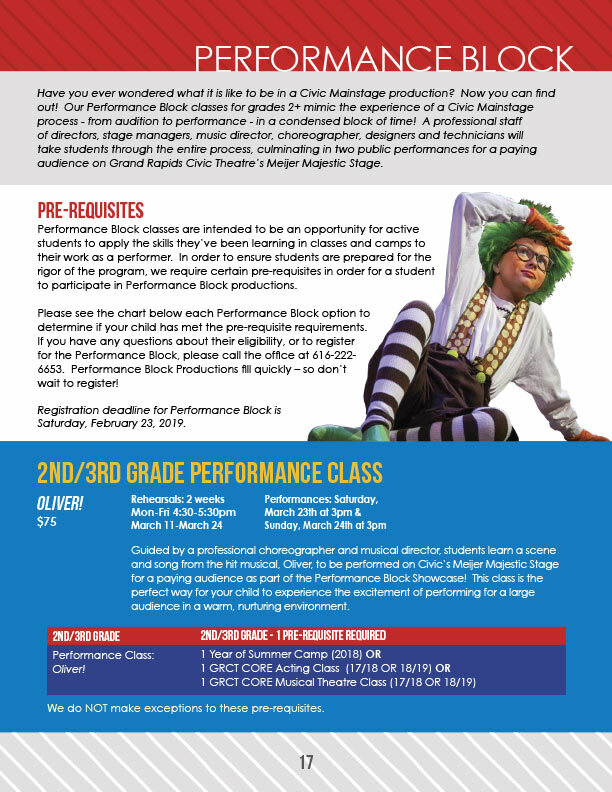 Registration deadline for the Performance Block is Saturday, February 23, 2019. 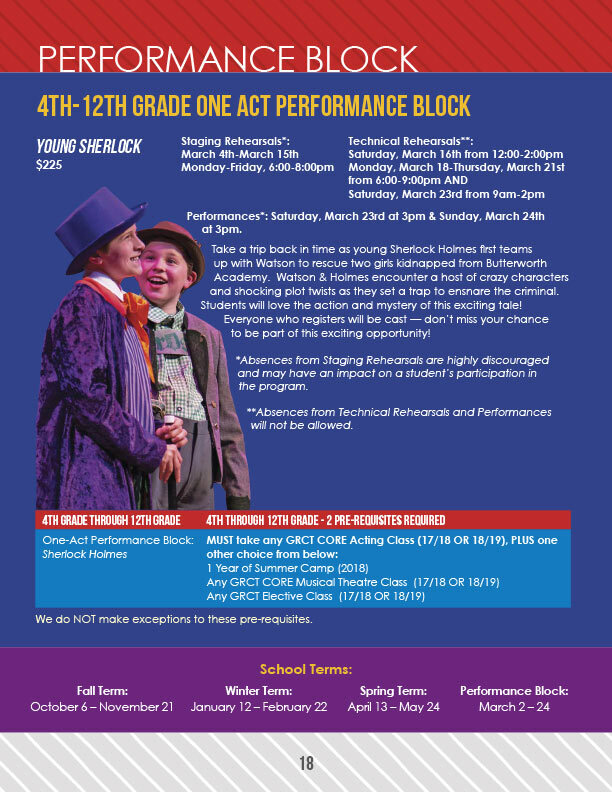 Registration for the Performance Block can be done by contacting the Education Office at 616-222-6653 with payment due at the time of registration. 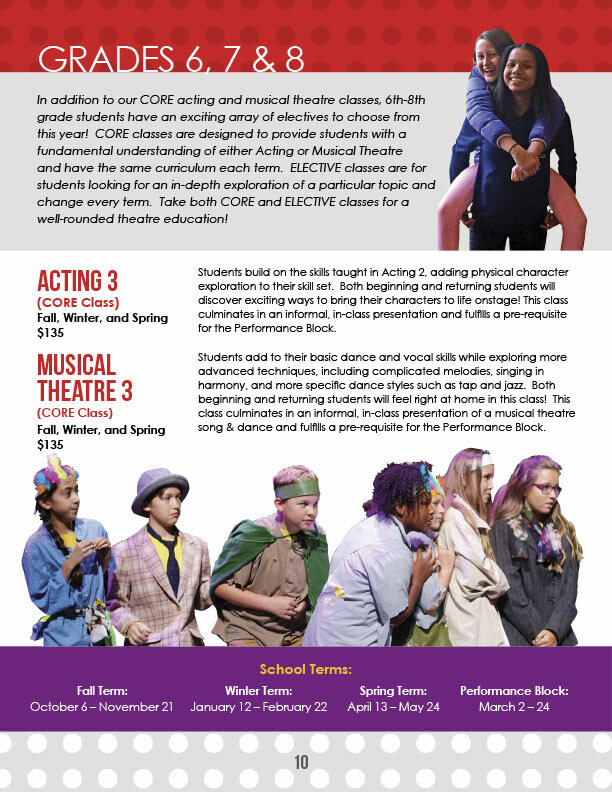 To determine if you have met the required pre-requisites for the Performance Block, please click here or contact the Education Office at 616-222-6653. NO REFUNDS WILL BE ISSUED FOR THE PERFORMANCE BLOCK AFTER THE REGISTRATION DEADLINE OF FEBRUARY 23, 2019. Please note our new registration deadline: registration closes 6 days before the first day of each class to allow faculty to plan and prepare. No late registrations will be accepted. 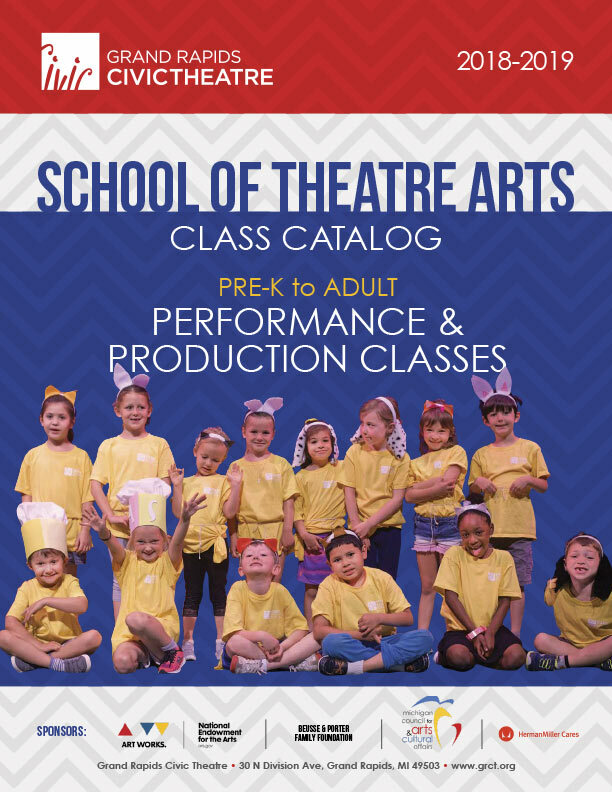 If enrolling ADULTS ONLY, please click here to register for classes. 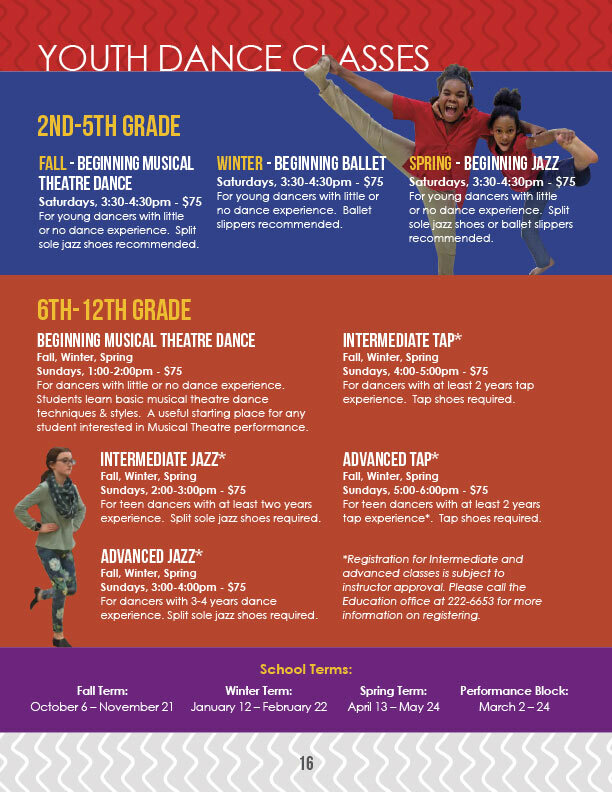 If enrolling in YOUTH CLASSES, or YOUTH AND ADULT at the same time, please click here. Click on a Register Here button below to view the schedule and link to our registration area. Select a page to view larger or the calendar below to download a PDF of the latest course dates & times. Click Here Download a printable registration form. In the event that the Theatre must cancel a course, a full refund will be issued. If a student requests a withdrawal, on or before the first day of class, a full refund less $10 cancellation fee will be issued. Withdrawals before the second day of class are refunded at 75% of the enrollment cost. Refund is forfeited if withdraw occurs on the second day of class or later. Performance Classes: No refunds are issued after the final registration date. Summer Day Camps, no refunds are issued after the start date of camp. 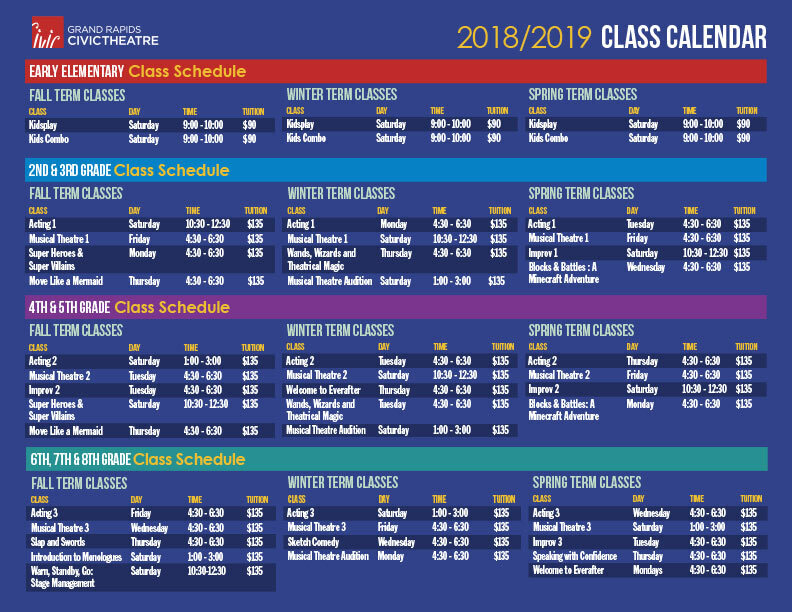 In the event that a class is cancelled, every effort will be made to schedule a make-up class, according to instructor and space availability. 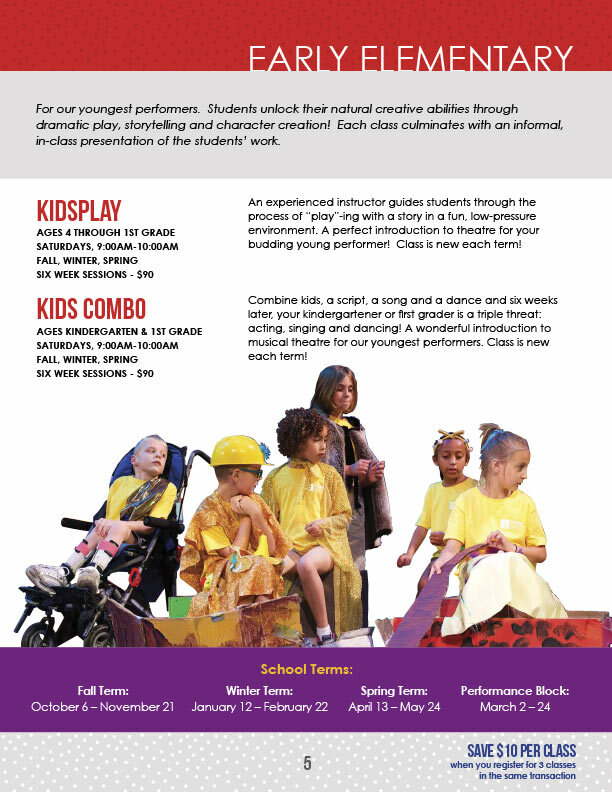 We are committed to artistic excellence through a comprehensive arts education program which builds confidence, fosters collaboration and inspires creativity.